After working on Cushion for over a year and a half, I’ve gotten the sense that I reached the limit of my personal “network”. I have a solid number of people following me on Twitter, which has been crucial to Cushion’s success so far, but I can only shout about it so much before there’s no one new to hear about it. Instead of just building more features and hoping more people will discover Cushion, I need to designate more time to getting the word out beyond my own circles. So far, this journal and the expenses page have been the most successful ways of getting people to share Cushion. Ironically, neither of them were built with this intention—I simply wanted to share what I learned and keep a record of my mindset for reference. Considering how much the transparency helps spread the word of Cushion, I’ve started exploring other ways to share insights. I plan to add a new page, similar to expenses, for my time-tracking data spent working on Cushion. Since the initial idea, I’ve been tracking my hours out of pure curiosity. As of writing this, the current tally is at 1,747 hours and 23 minutes, which doesn’t include responding to support emails or writing journal posts. Because I was in a sprint to launch, I only kept a single timer for working on Cushion, but I want to separate it out into design, development, support, and other miscellaneous tasks. Development will most certainly be the clear winner, but I’m really curious about how the others add up. On the reverse end of successful strategies is referral links. Leading up to the launch, I built a referral system for Cushion. 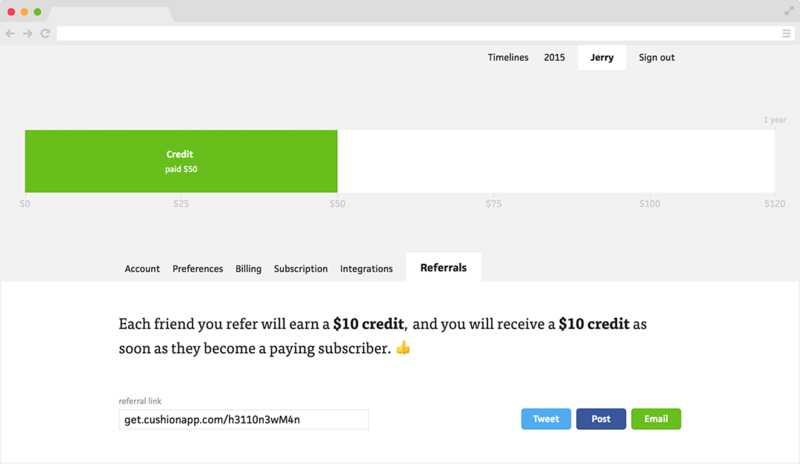 Existing users could earn credit by inviting other users to join and anyone they invited would earn credit as well. I imagined this would help spread Cushion like wildfire because I always use referral links to share services I like. So far, however, the referral system has been a dud. Only a handful of people have shared their link and a very small fraction of those who sign up stick around to subscribe. I’ll keep it around, but I don’t expect to get much more from it. For a very brief period of time, I tried using Google Adwords, but quickly realized that proper advertising is not a viable option for individuals bootstrapping a business—it’s just too expensive. After a week, I decided that my time and money could be better spent in other ways—at least for now. As a longtime (though dormant) member of Dribbble, I thought it might be worthwhile to start posting designs throughout the process—especially ones that don’t make the cut. I’ve always been fascinated when people share more than just the final design and Dribbble is a great place to do this—it also has a huge community of freelancers, so it becomes another place to get the word out. 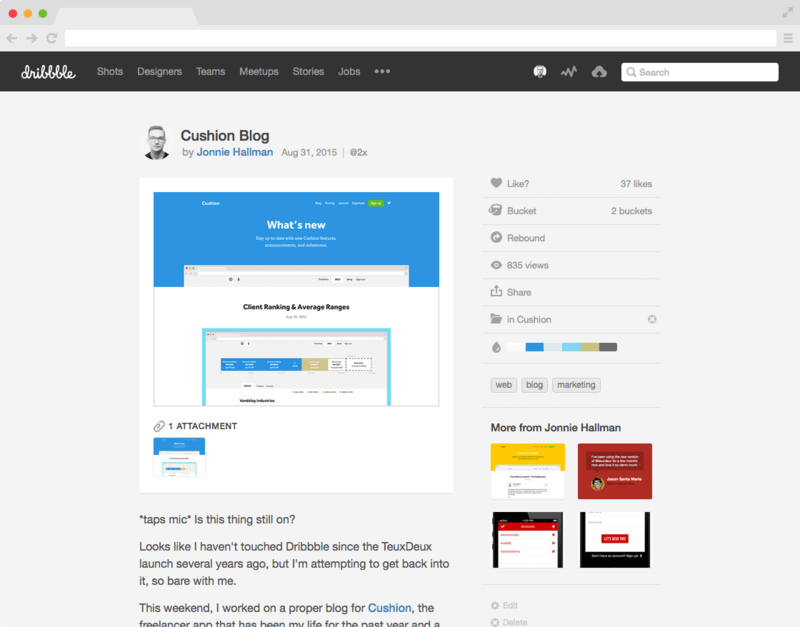 Along with Dribbble, I also created a mirror of the Cushion journal on Medium. With its immense community and ability to follow “publications”, I figured it wouldn’t hurt to publish it in more than one place. With their recommendation system, journal posts could make the rounds automatically and help route people back to the Cushion website. 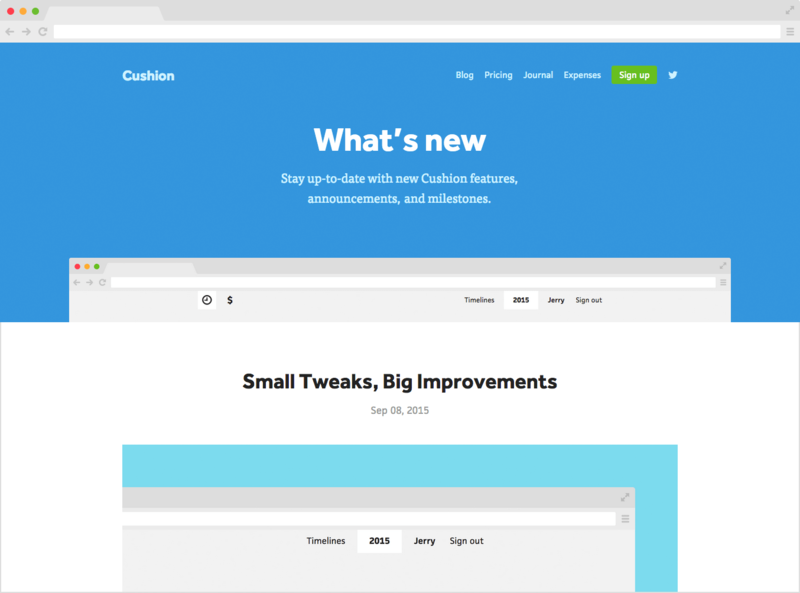 I recently added an actual blog for Cushion, so I could write about new features and other announcements. 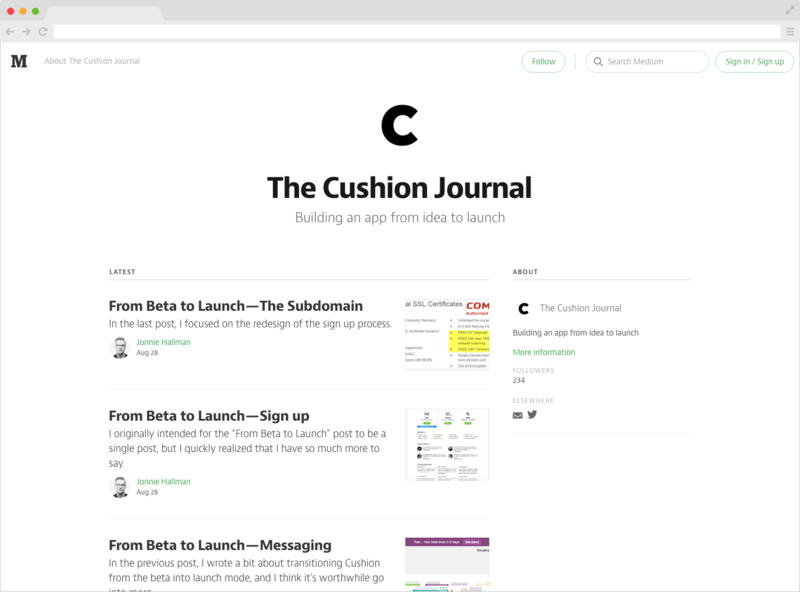 The journal worked well through initial development, but now that Cushion has launched and is open to the public, I needed a way to share updates that are more about “what” and less about “how”. This blog is mainly geared towards people who might not use Cushion, but interested in following along with its progress, so they could sign up one day. In addition to updates, I’d also like to use the blog for things like user case studies or interviews. I’ve spoken with dozens of users who “hack” Cushion in ways I never intended. I’d love to highlight those use-cases to show Cushion’s flexibility past the typical freelancer story. For example, I personally use Cushion to track Cushion’s schedule and monthly income. I’m certain other app owners could use Cushion to do the same. I’ve been fortunate that word-of-mouth and the organic spread of Cushion has gotten me this far, but now it’s time to designate would-be-dev-time to outreach. I still haven’t reached out to any blogs or communities about Cushion. I’ve been so heads-down building it that I haven’t had much time to focus on marketing besides the marketing website—another downside of working alone. I need to allot a couple days a week to just marketing or hire someone else to do this for me. The initial plan is to email writers for relevant blogs and just let them know that Cushion exists. I still feel like it’s off the radar of most people—especially those who have no ties to me, so exposure in any other outlets will go a long way. Hopefully, they’ll feature Cushion and help it make the rounds. Based on how that goes, I can continue reaching out to more bloggers on a consistent schedule. The reality is that running a sustainable app isn’t possible without a strong focus on marketing and finding new users. Even with the leg-up of a wide network, it’s an uphill battle to keep the graph going up. Hopefully, these approaches hit and Cushion can continue to grow. If you want to help, simply spread the word.